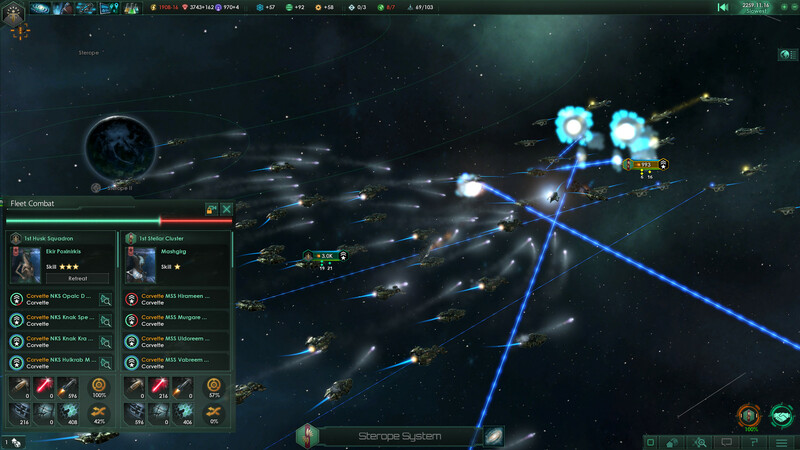 Stellaris is Paradox Development Studio’s upcoming 4X interstellar space strategy game. The studio’s best known for its work on Crusader Kings II and Europa Universalis IV, two grand strategy games with historical settings. Like other 4X titles, Stellaris’ gameplay revolves around space exploration, managing an empire that spans multiple worlds, warfare, and diplomacy with alien civilizations. I got in touch with Paradox’s Henrik Fåhraeus to talk about the game. Read on! Thank you for answering a few questions for your upcoming game, Stellaris. Would like to introduce yourself and give our readers a description of your position? I am Henrik Fåhraeus, currently the Game Director at Paradox Development Studio, but I’ve worked on most of our games over the years, in one capacity or another. There are many questions that players have for Stellaris. It is classified as being a “4X” game. Would you care to go over what “4X” is and how it affects the main focus of the game? While I am not a huge fan of such classifications, it is certainly true that Stellaris has a lot in common with many so called “4X” games. The term stands for eXplore, eXpand, eXploit, eXterminate, and is intended to describe the normal stages in a strategy game of this type. The defining characteristics are that you start out small in a procedurally generated world that you will start exploring and colonizing (expanding into.) You will find resources you can exploit in order to exterminate the rival empires. Based on what you’ve previously shown of Stellaris, this game clearly sets itself apart from your studio’s previous projects. Would you care to go some of the improvements made that stand out for seasoned strategy gamers? I think strategy game veterans will especially appreciate some of our particular brand of game mechanics that you would not expect to see in 4X games. For example, the fact that you cannot simply declare war and seize every planet your armies manage to secure. Then there is the way our alliances work, where all members will want their piece of the cake… Alliances can also be developed into full-fledged Federations. How does Stellaris differ from other 4X space strategy games like Sins of a Solar Empire, Master of Orion and Galactic Civilizations III? 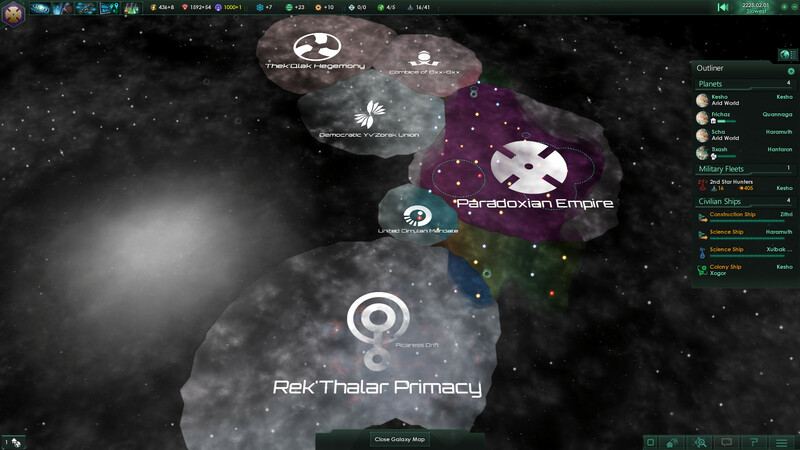 Apart from the above – the fact that Stellaris is a bit of a hybrid between a 4X and a Paradox style Grand Strategy Game – we have put special emphasis on the first of the four “eXes”; eXploration. 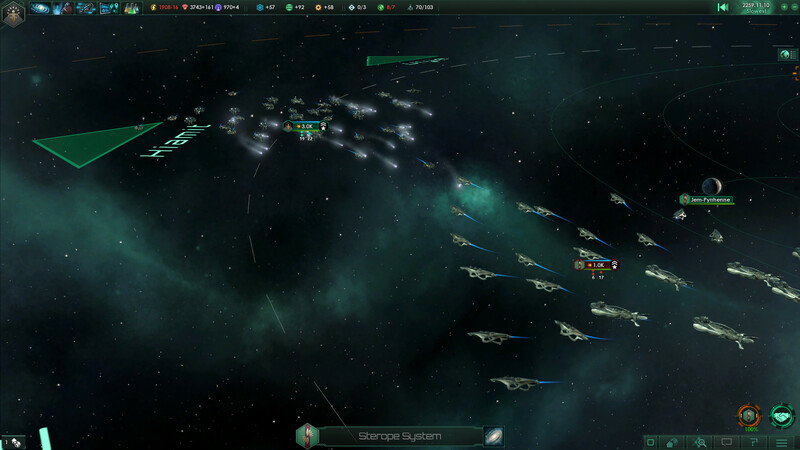 Stellaris features a special ship type called a Science Ship, which is commanded by a Scientist Leader character. These ships go around and explore the galaxy, uncovering and researching various interesting anomalies as they go, a bit like the heroes in a role-playing game. In general, there is a lot of content like that; cool things that can happen on your colonies or out in space throughout the game, but especially in the early stages. In your past games like Crusader Kings II and Europa Universalis IV, the amount of detail put into the lives of leaders was significant. What spurred the dev team to remove such detail in favor of leaders that die? Is there a way to preserve leaders, like turning of aging for example, if players wish to do so? Leaders die in CKII and EUIV as well; it’s just a natural part of being alive. 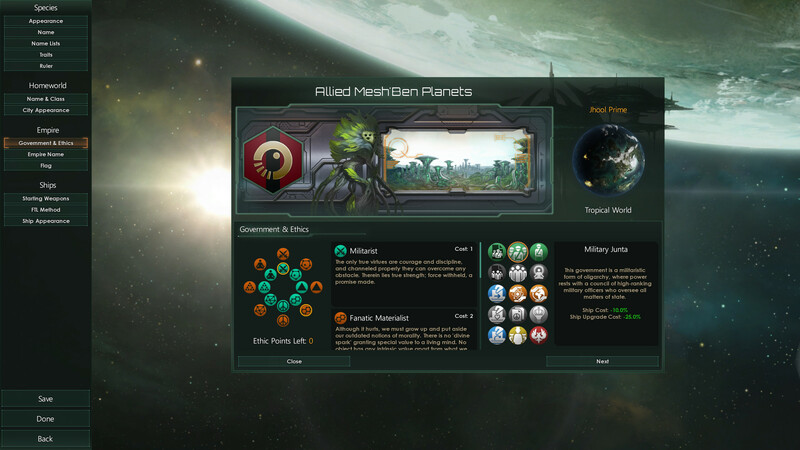 Perhaps it’s even more important in Stellaris however, since characters gain experience and improve over time. Though it hurts, they need to be cycled out. Currently, there is no way of disabling this mechanic, but you can extend the lifespans of leaders through technology or racial traits. Exploration seems to be a key component for creating a successful empire. With the generation of galaxies being completely random, to what extent can players go through the game without seeing multiple of the same factions, planets, or battle encounters? How does the game regulate the experience to combat the duplication of situations? Essentially, you will never encounter exactly the same alien empire twice. While you will see the base alien portraits being reused, we do have a lot of them (about 100), and they can have texture variations and different sets of clothes, etc. Their behaviour and goals are also guided by their combination of Ethics and racial traits. When it comes to scripted content it’s harder, but we’ve tried to make sure there are plenty of possible branches and options in these little stories, often depending on the Ethics of your empire and the personality traits of your leaders. There are also plenty of very rare such stories and encounters, in order to ensure that players keep getting surprised. There seem to be three main units to each empire: Research, Military, and Colony Vessels. To what extent can each of these three ships be modified to gain advantages in game? The military ships themselves are actually split into four different sizes, and adding to that there are military stations of different sizes and such. There is a fairly involved ship designer that mainly allows you to customize your military ships in interesting ways. There are weapons hard-points and utility slots of various sizes, as well as entire different ship sections that can be mixed and matched according to your needs. One of the “Win States” for Stellaris is to conquer the majority of the galaxy. What types of mechanics does the game have to keep the player interest when his or her empire is overwhelmingly more powerful than enemy forces? This is a really interesting question! It’s a kind of built-in problem with most strategy games. In the main, we’ve taken a two-pronged approach: First, we have rather complex internal mechanics where your population can start causing problems and organizing into troublesome political Factions that you need to manage. If you don’t, it can lead to civil wars and secession. Secondly, there is an increasing risk of a major galactic crisis as the various empires start researching and using very advanced technologies. On a related note, the level of micro-management remains fairly constant throughout the game thanks to a mechanic we’ve borrowed from CKII; you cannot control all planets directly. In the same way that you need to rely on vassal rulers in CKII, you need to assign planets to Administrative Sectors in Stellaris. Stellaris seems like an extremely complex RTS. How long does an average game take to complete? That is actually a surprisingly difficult question to answer. It depends on the size of the galaxy, how much you tend to pause the game to think and give orders, and what speed you’re running at. In general though, it is slower paced and will take longer to play through than most similar games. Are there any hidden threats that come from outside of the assortment of rival empires? Are there any that are extinction level events that occur in the early to mid-game? Are there any consistent storylines that are followed (ancient extinct races and lore) into other playthroughs, or is every new session given its own personal path to uncover? There are several possible backstories like that which you might see again, though sometimes with variations. This is an area of the game that I’d love to develop further in some future expansion. When is the earliest players could get their hands on Stellaris and explore and conquer the universe? Apart from our closed beta testers… May 9th, when the game is released. Your studio previously specified that there would be some types of super weapons in future DLC. Is there a possibility of seeing any iconic galaxies or space empires that scifi fans would recognize? Are there any words of encouragement you might have for people who want to develop great strategy games like Stellaris? Well, things have gotten easier for Indie developers in these days of crowdfunding and digital distribution. PR is really important if you want to get funding, obviously, so get the buzz going and don’t aim too high to begin with. Get your core gameplay right, show it off, talk about all the other cool things you want to add, get people to fund you and evolve from there. Rome wasn’t built in a day. Are there any important thoughts about Stellaris that you would like to add in order give our readers more to look forward to?